This is the first of a number of stories I am republishing here. Willy, what brings you down the road? Hi Betty! Hello Hank! Would you have anything to let me pick up change? Do you mean like off the floor or carpet Willy? 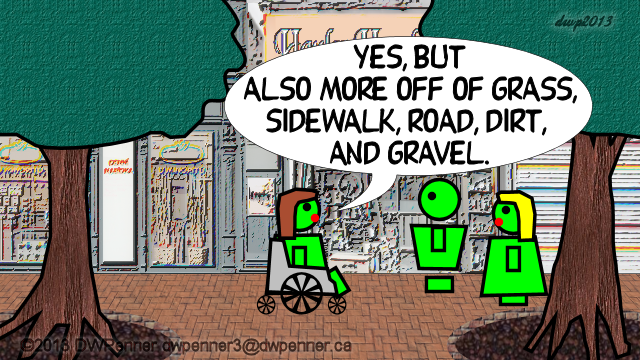 Yes, but also more off of grass, sidewalk, road, dirt, and gravel. Why do that Willy? Small change will hardly buy a cup of coffee? That’s just it, small change adds up. I’m putting it all in a jar and saving it for charity. Every cent counts. It all adds up to make a difference. It really is a Jar of Change! 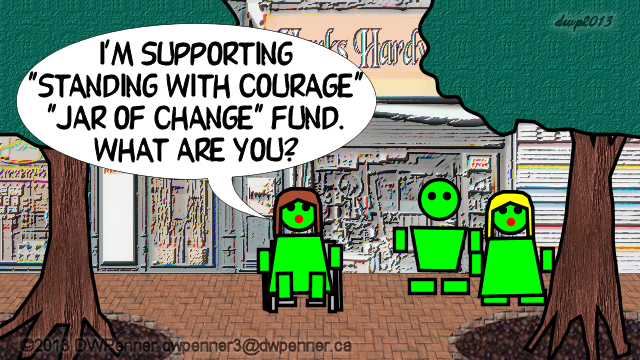 I’m supporting “Standing With Courage” “Jar of Change” fund. What are you? 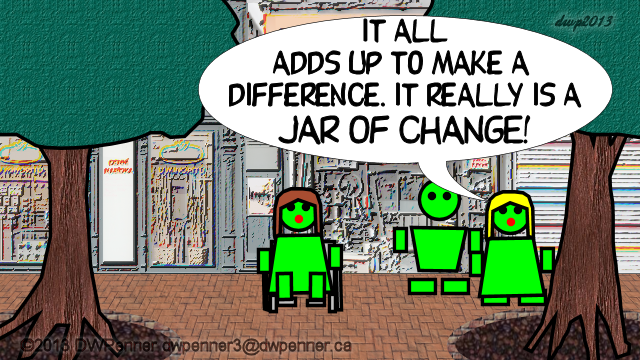 “The Jar of Change” fund is a fund-raiser being done by “We’ll Make Cents” to raise money to purchase a “Standing Frame” for a not-for-profit health concern in Auckland NZ. They are encouraging people to put a jar on their night stand and each night put the “50¢” pieces that are in their pockets at the end of the day in there. 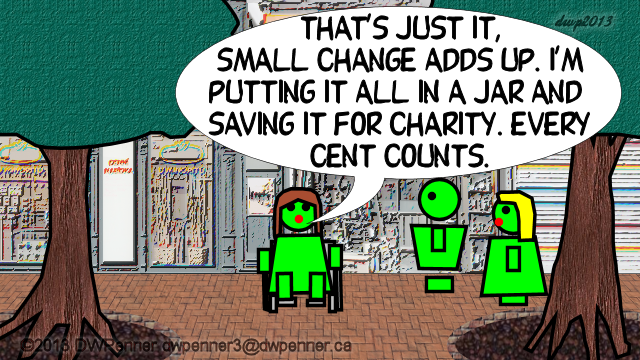 The collected change would be brought to “We’ll Make Cents” or directly to the health concern. 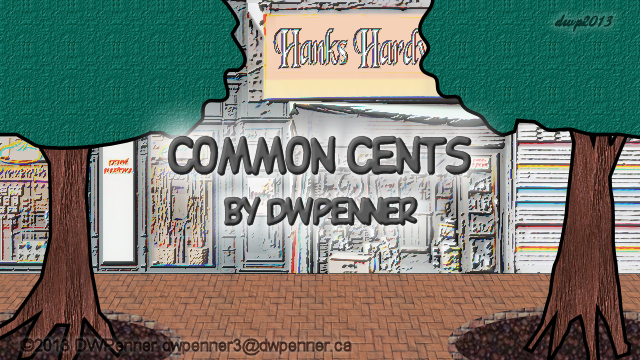 The change collected needn’t be just 50¢ pieces, but any spare change. The idea is that while it might be difficult to budget much for charity, a little here and there adds up. 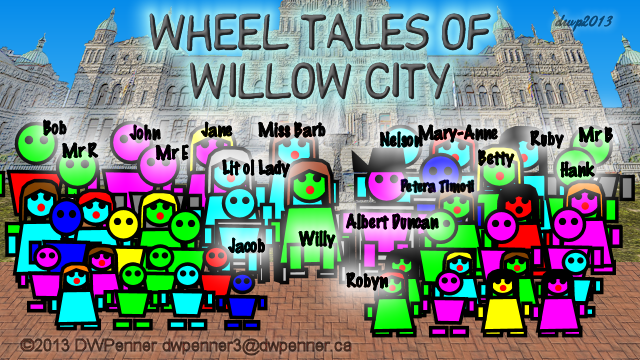 This entry was posted in Cartoon Strips, Wheel Tales of Willow City, Writer's Words and tagged Auckland, Auckland NZ, Cartoon, Cartoon Strip, charity, coins, Comic, Comic Strip, Common Cents, Darrell W Penner, disabilities, disability, disabled, DWP, DWPenner, fund-raiser, fund-raising, fundraising, Jar of Change, New Zealand, nonprofit, not-for-profit, spare change, Standing Frame, We'll Make Cents, wheel chair, Wheel Tales of Willow City, wheelchair, Writer's Words by DWPenner. Bookmark the permalink.